Dan berikut ini soal Ujian Nasional SMP Pelajaran Bahasa Inggris. Selamat belajar! l. Why does the school issue this notice? This text is for questions 3 to 5. 3. Why does the school publish that announcement? 4, What can students present in the art exhibition? 5. 'the 5th annual students art exhibition." This text is for questions 6 to 8. Approaching the summer holiday 2017, Bintang Prestasi secondary school is organizing "Youth Summer Camp"
We invite all student to this program. 6. What is the announcement about? 7. What should students do if they want to join the program? 8. We know from the announcement that the program ... for one week. Read the text and answer questions 9 and 10. Saturday, April 5th ot 2.00 p.m.
we hope you can join us for food and fun! 9. What is the writer's purpose to write the text? B. To announce Amelia's birthday pary. D. To inform how to come to the birthday party. 10. What should you do first on before going to the party? 1.30 p.m. 2.00 p.m.2.30 p.m.
6.30 p.m. 7.00 p.m. 7.30 p.m.
Tours of the school every half an hour. There will be chance to explore the school further, meet the staff, children and governors and to see our exciting curriculum in action. Intake for September 2016 is 120. Class sizes of 30. 11. What could the guests do at the school tows? A. To see the students actions at the class. B. To discuss with the staffand the governors. C. To learn more about the school and curriculum. D. To observe school facilities and school members. Located in the Suburban area of Semtrilg, Sanlosa hotel offers well furnished rooms in 'the calm and peaceful atmosphere. It features acozy restaurantwhich provide many kind of Indonesian and International cuisine, a large ball room, meeting room and art gallery,Featuring spacious and elegant interiors, each air-conditioned room is provided with a cable TV, a bathroom a wardrobe, a tea or coffee maker, and minibar are also available. Guest can exercise at the fitness center or enjoy a refreshing dip in the indoor swimming pool. 13. The text is addressed to travelers who want to. ..
A. spend the day in a cheerful atmosphere. B. relan in a quiet a place. 14. What additional facilities can be enjoyed by the guests? D. Local and International foods. 15. "Featuring spacious and elegant interiors ..."
This text is for questions 16 to 19. Mr. Tucker is my math teacher at school. He teaches us at class IX. He is a smart teacher. He can teach us very well. He is a strict teacher. He doesn't like his students came late at class. He will be very angry. Besides that he doesn't like us cheating in the test. He always tells us to be honest. His students must pay attention to his explanation. Besides that Mr. Tucker always does the same things everyday. Entering the classroom, he will wash his hands in the basin in the corner the class. After that he will walk over to his desk. Sitting in her desk, he will look at and greet us formally. Then he will put on her glasses, open his textbook and ask us what lesson we discussed the previous meeting. And then he starts teaching. I was really amazed by his habit. 16. What is the writer's purpose to write the text? 19. "I was really amazed by his habit." The following text is for questions 20 to 23. The Snard is an 87-storey sky scraper, which sits in the heart of London. It is known as the shard of glass. Construction began in 2009 and was completed three years later in 2012, making it Western European's tallest building. Designed by architect Renzo Piano, The Shard is the second tallest free standing structure in the UK. Its exterior boasts 11,000 glass panels - that's equivalent in area to eight football pitches or two-and-a-half Trafalgar Squares. The building was developed to have multiple uses, describes on the website as a'vertical city where people can live, work and relax'. This motto was clearly taken on board that was found on the 72nd floor towards the end of construction. 21. In Europe, the Shard gains popularity on its .. ..
22. What probably makes people interested to stay in the Shard? A. It has multiple uses. 23. "..., making it Western European's tallest building." Last year I joined the Chicago Marathon, my first marathon contest. I had to run 26,2 miles to complete it. It was hard. At first, I just wanted to get the experience of joining a marathon. I thought it would be one life time experience. After finishing it, I changed my mind. I wanted to join another one. I was interested to complete at least one more marathon and improve my time. I also experienced a good feeling between participants and the spectators that made me happy. It was a very wonderful thing for me. So I decided that I had to join another marathon the following year. 24. What is the text about? A. The writer's activities of watching Chicago marathon contest. B, The writer's wonderful feeling after watching marathon. C. The writer's good achievement in marathon. D. The changing of the writer's feeling after joining the marathon. 26. What was the writer's intention when he decided to join his first marathon? This text is for questions 28 to 31. 1. Find the artist whose song's you want to download. In the address bar at your browser, . search the video's address. 2. Pop along to www.cljp consorter cc and use Ctrl-V to paste the clip's address into the Media URL to Download box. 29. What should we put in the media URL? 30. What will happen if the download process is successful? 31. "and open it to hear the song"
This text is for questions 32 to 35. 32. 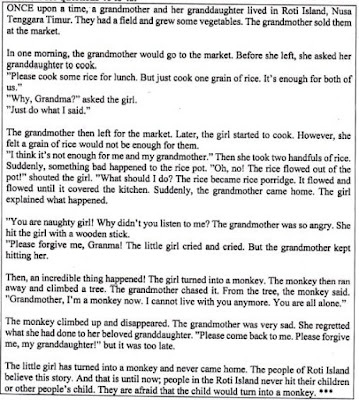 What is the topic of the story? B. 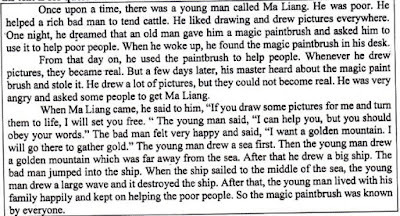 A good Painter and a greedY king. 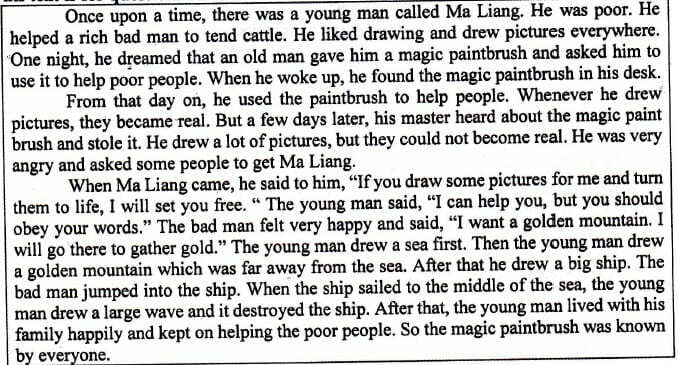 C. A clever Painter and a wise king. D. A Young man and his king. 34. What would happen if Ma Liang didn't kill the King? B. The King would kill him. C. He would get big prize from the King. D. He wouldn't be able to help poor people. 35. How was Ma Liang like? This text is for questions 36 to 39. 36. What is the text mainly about? A. The power of lightning. B. The danger of lightning. C. The definition of lightning. 37. How can the lightning be dangerous while we are taking a bath? A. The electric shock could be delivered along the water pipes. B. The lightening can be transmitted via electronics. C. The lightning strike can protect them from damage. D. Electronic in houses can deliver telephone and televisions. D. Turn on the torch. 40. What is the purpose of the text above? 42. Penguins are torpedo-shaped, flightless birds that live in the southern regions of the earth." D. Penguins live the north Pole. 43. What can you learn from the text? This text is for questions 46 to 48. 46. What is the purpose of the text above? 47. 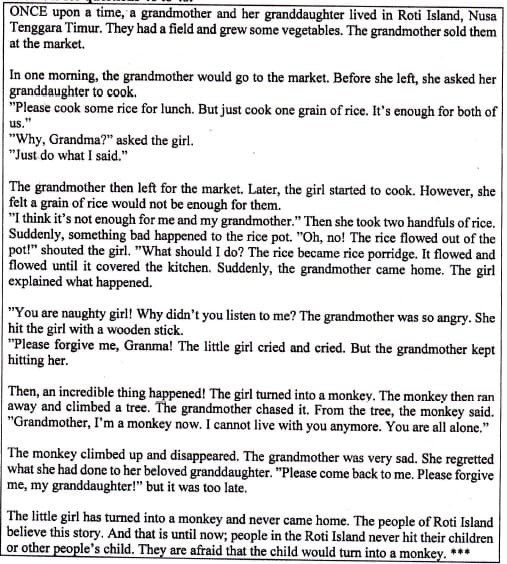 What happened when the granddaughter cooked the rice? Read the text and answer questions 49 and 50. CONGRATULATIONS! I know you must be proud and happy to attain the rank of Eagle Scout. May the high goals and ideals which led to this special honor continue to inspire you in the years ahead. 49. What is the writer's intention to write the text? 50. 'May the high goals and ideals which led to this special honor continue to inspire you in the years ahead." we can infer from this statement that the writer hopes Davish .,..